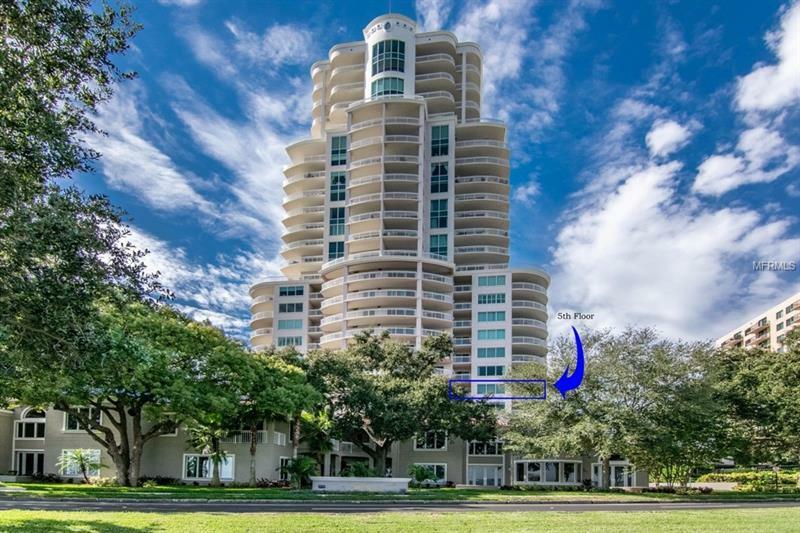 SPECTACULAR PANORAMIC WATER AND DOWNTOWN TAMPA SKYLINE VIEWS FROM CORNER BALCONY. Share the elevators with only two other units and then walk through the double door entry into this 3 bedroom/3.5 bath home where the water views are captivating. Upgrades include wood floors throughout the living spaces, granite countertops, inviting warm wood cabinetry in the kitchen with center island, eat-in breakfast bar, crown molding throughout, walk-in closets, electronic window treatments, plantation shutters and much more. The 2 AC systems are newer installed in 2015. Master bedroom suite has a balcony and looks to downtown Tampa, 2 walk-in closets, double vanity and a dual head shower. The laundry room is spacious, offers great storage and is equipped with a sink. This 24-story condo tower has an on-site manager, 24-hour security guard in main lobby and security cameras surrounding the building. There are two secured parking spaces. Amenities include Fitness Center, Theater Room, Billiards Room, Card Room, Social Room with Bar/Catering Kitchen, Heated Pool and Spa, and two visitor Guest Suites. Turn Key condition to get you moved in and enjoying the views with coffee in the morning or happy hour as the sun sets.